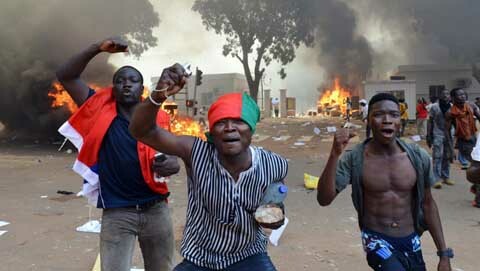 We stand with the people of Burkina Faso in their effort to establish the rule of law and peaceful democratic process. We strongly condemn the attempted derailment of the democratic process by the Presidential Guard who try to hijack the will of the people and bring confusion, destabilization and loss of life to the country. The Presidential Guard (Regiment de Sécurité Présidentielle) must respect the rule of law, and immediately cease from perpetuating violence on civilians. One wonders how those who are supposed to protect the president are now the ones endangering the life of the president and his cabinet. Why should the Presidential Guard disrupt a functioning participatory and peaceful democratic process scheduled to take place on October 11, 2015? This undermines the wellbeing of the peoples of Burkina Faso. The actions of the Presidential Guard are certainly not for the common good. AFJN is deeply suspicious of the actions of the Presidential Guard, especially as it comes on the eve of making public the investigations of the actions of the previous regime. What are the members of the Presidential Guard afraid of? We call upon ECOWAS, the AU, the United States Government and the European Union (especially France) to stand with the people of Burkina Faso and bring an end to violence and arbitrary detention of the members of the transitional government. We call upon the people of Burkina Faso to do everything within their power to reclaim their sovereignty and reinstate their democratic institutions.